Via the ‘Art of Manliness‘. I recall from some random documentary that one of the safest places to be in a storm is in a car, but if you’re out and about this is probably worth memorising. You never know. The odds of being struck in your life time are apparently 1 in 3000. It’s scary enough just being close to a lightning strike. 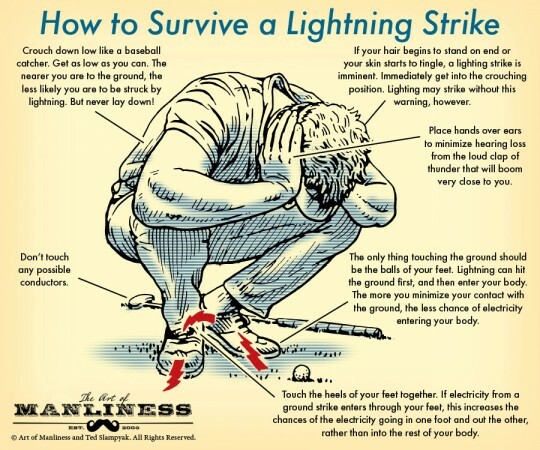 I remember being at a Boy Scouts camp years and years ago where lightning touched ground in a bad storm about 75-100 feet away, and all I remember about it was incredibly bright light and this deafening roar even when you covered your ears. It actually hit some poor kid’s tent, although he survived. Wow! Glad everyone was okay. …and other than being a little shook up, lived to tell the tale (They were riding on a tracter at the time). That’s impressive – a cursed farm!